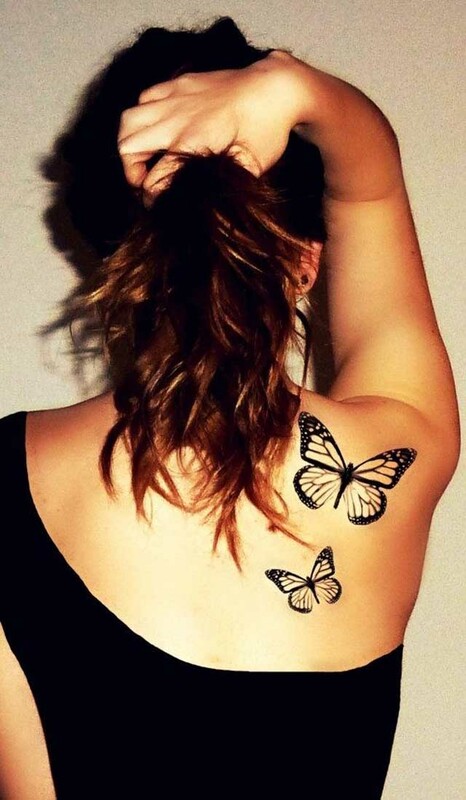 Butterfly tattoo designs are so popular nowadays. 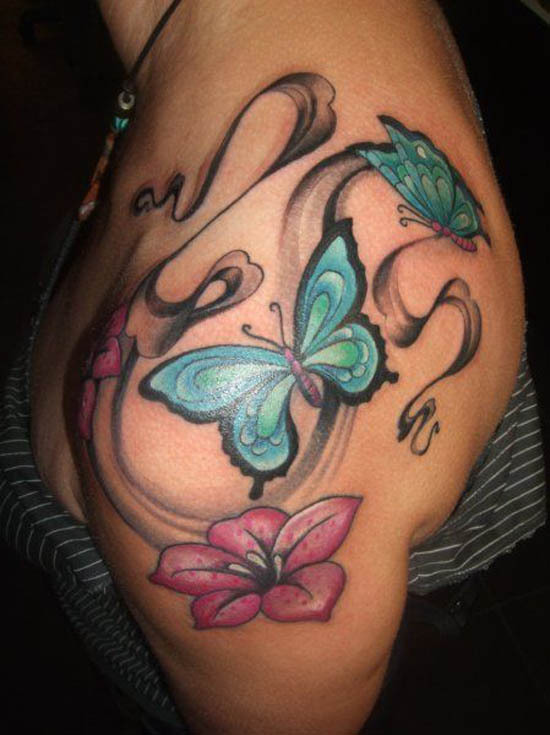 Butterflies can stand alone as a tattoo design. 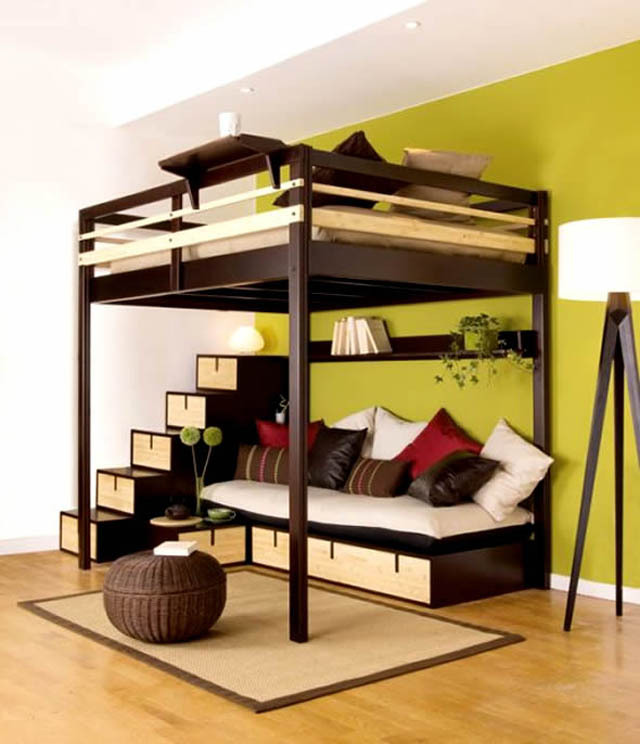 However, it is not uncommon to see a juxtaposition of additional elements. It may go with a skull, a cross, a dagger, a banner, or flowers, but the most popular are butterflies just like the following tattoo designs suggest. The same holds true with the beauty of a butterfly. It is a mythical creature we actually see regularly. It is often associated with what is grand and colorful. 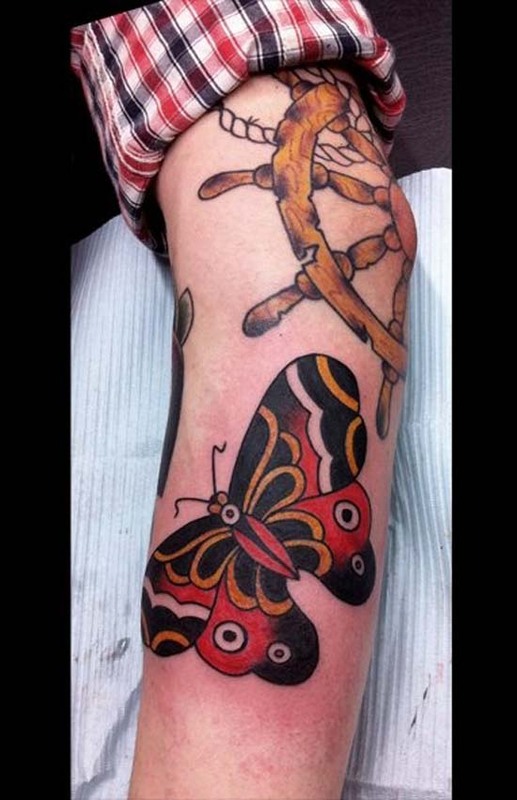 Here are some of the best butterfly tattoo designs that you may actually try. A blue butterfly and an orange butterfly star in this arm tattoo design. Both beautiful creatures are resting on branches of a pink hibiscus plant. 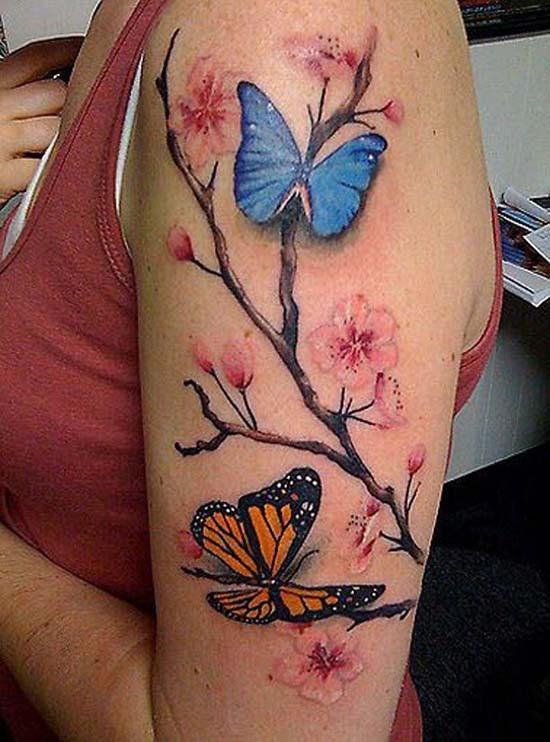 The shading in the flowers and the butterflies, along with the twigs are superbly done. Black butterflies of elegance fly behind you in this great back tattoo. Two butterflies of different sizes are inked black and similarly patterned and outlined. They are positioned just under the right shoulder. A minimalist and sleek approach to tattooing. 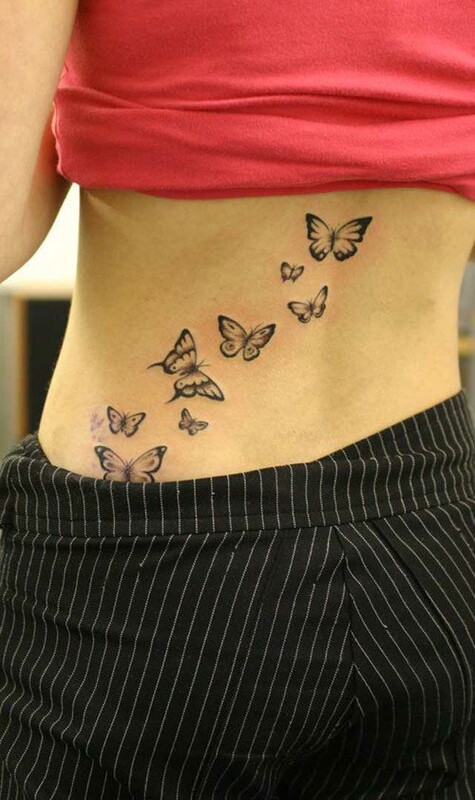 Dainty little butterflies adorn your back in this tattoo design. 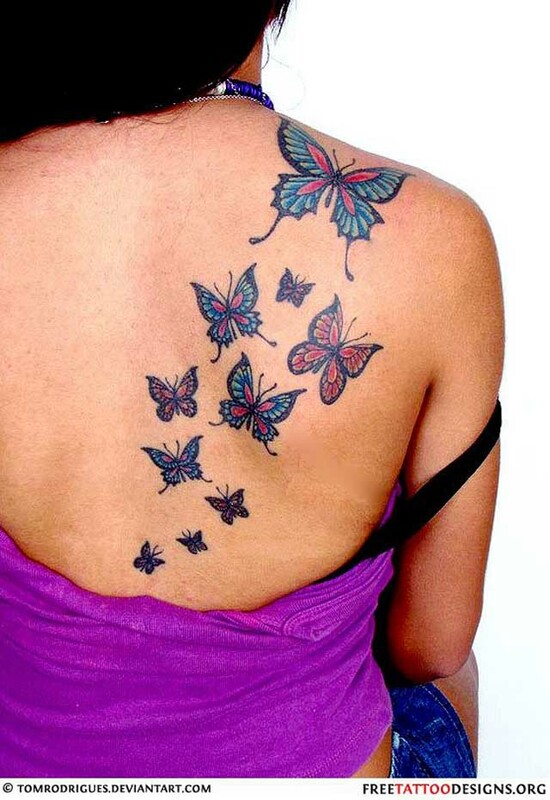 Although solely colored black, the angles of each butterfly suggest that they are playfully soaring high. Each also has a pair of uniquely patterned wings. This red-and-blue back tattoo is a tribute to colorful butterflies. The stenciling of the butterflies is similar to the shape of the real creature, and not whimsically made. The butterfly on the topmost part (shoulder-level) is the largest, followed by a by-size troop, to the smallest. 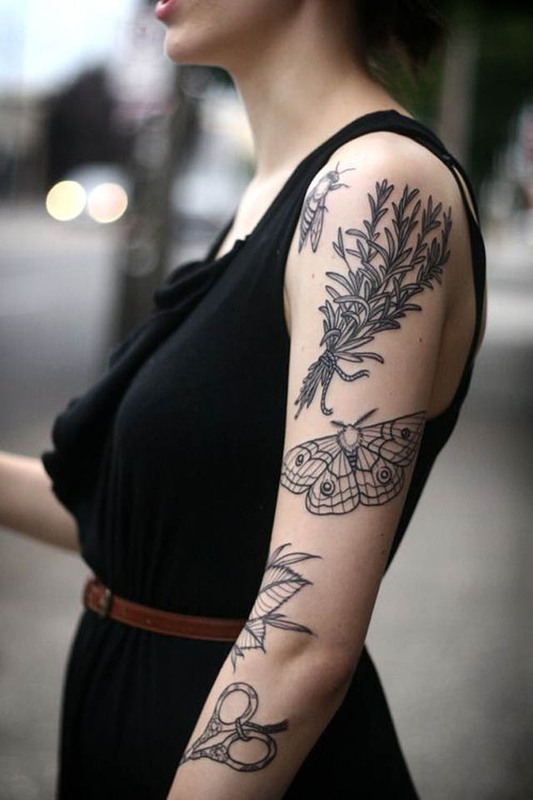 A fly, a bunch of shrubs, a butterfly, leaves, and pair of scissors randomly compose this poetic arm tattoo. The butterfly has a pair of very beautifully patterned wings. Everything is outlined in black ink, and is a very enticing crypt, overall. This colorful tattoo makes use of a multi-colored butterfly and a helm (ship’s steering wheel). The butterfly is colored black, red, orange, and the skin tone for the area of the pattern left uncolored. The patterns in the butterfly are almost of an ancient cultural feel. Two mystical turquoise butterflies are depicted in this design. The creatures are seemingly floating in a smoke of black streaks and pink flowers. A definitely catchy shoulder tattoo. Here is an attractive back tattoo just below the spine. The design is very linear, having a huge butterfly in the middle, as a centerpiece. Curving lines emerge horizontally from the butterfly, and for small butterflies hover above the design. Everything is inked black. 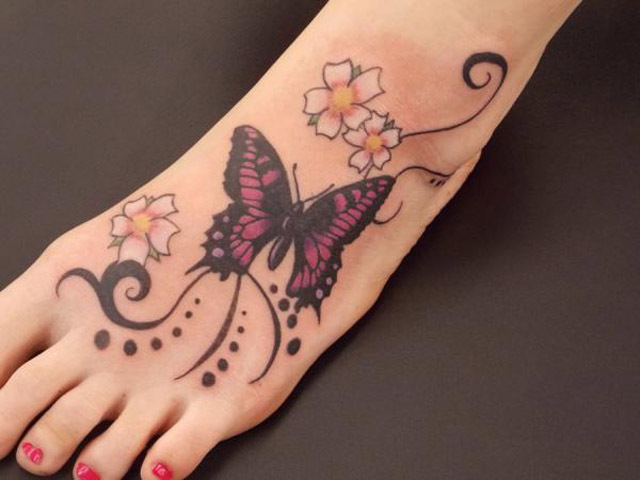 A foot tattoo with a majestic butterfly, this design is nothing short of pretty. The butterfly is colored fuchsia and black thus providing a striking contrast. It is further adorned by patterns and flowers. This artsy and whimsical lone butterfly is flying but illustrated on its side view. In effect, it looks like a butterfly which lost the other half of its wings. The brown-yellow-orange shading for the wings are impeccably made too. A one-of-a-kind butterfly. 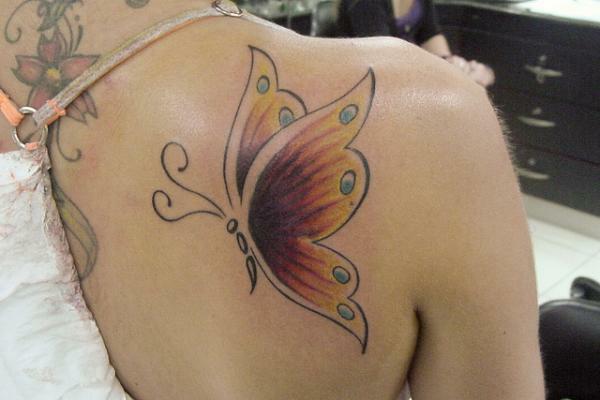 Here is a pink-and black butterfly tattoo positioned on the nape. 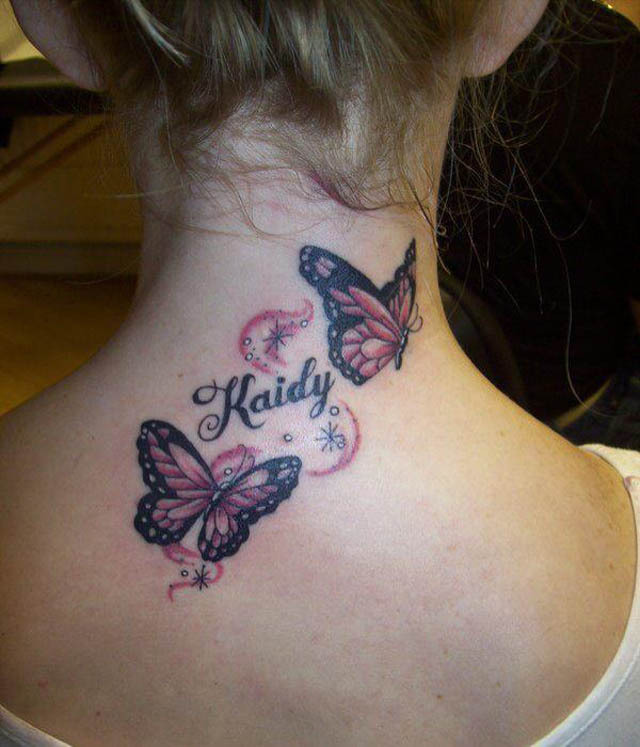 It has two butterflies flying beside the name Kaidy (changeable), making it appear like it is protecting the person with that name. Further, it has pink shadings suggesting movement. Everybody sees everything neon. 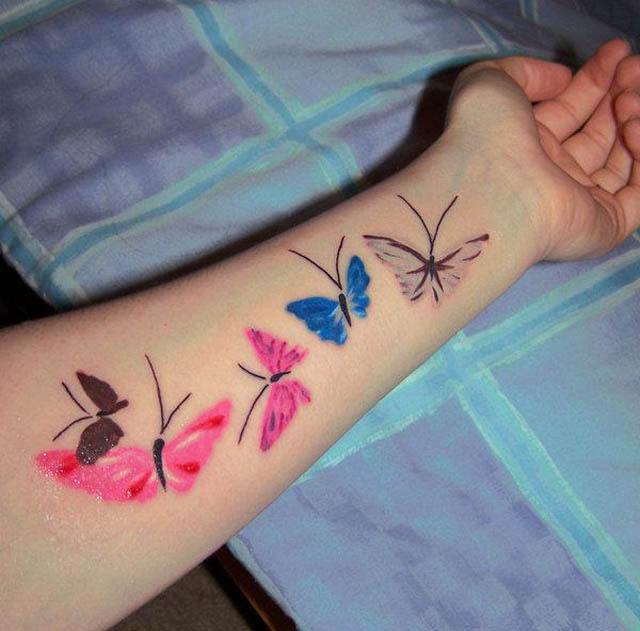 Especially these neon-inked butterflies arm tattoo design. Five beautiful butterflies which are shaded in the arm and not outlined, this is a total standout. The whole back is a canvass for this colossal colorful butterfly. The four corners of the wings reach the shoulders and the lower back sides, and the body of the butterfly is illustrated on the very position of the spine. A majestic tattoo of details and colors ranging from hues of blue to red and orange. An anklet will no longer be needed in this intricate gray-and-silver foot tattoo. The two elements of a flower and a butterfly are connected by cursive outlines with leaves. The wings of the butterfly wittingly hid initials. Subtle but decorative. Here is a very genius tattoo art. Each forearm has the exactly, and identical design of the other – only, inverted. 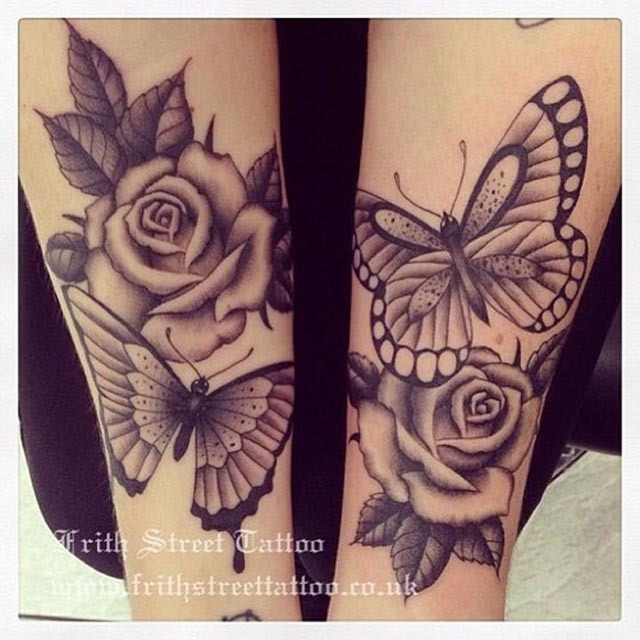 A butterfly on top of a rose on one arm, and a rose on top of a butterfly on the other. Both are perfectly shaded and solely use the color black. The shadings differ, making it avoid a flat feel to it. 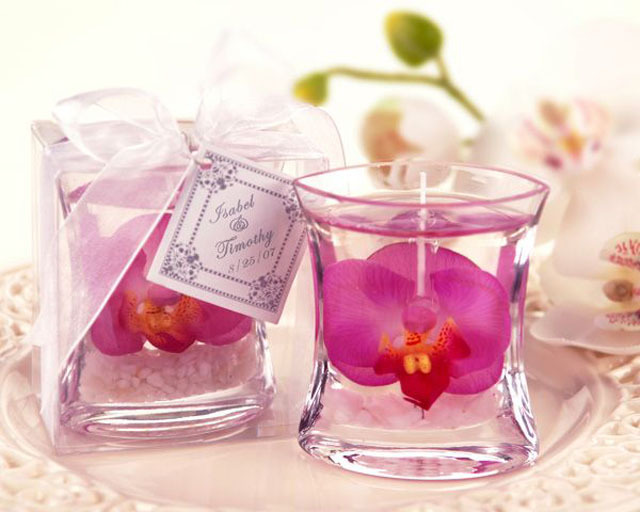 13 Homemade Wedding Favor Ideas To Personalize Your Favors!